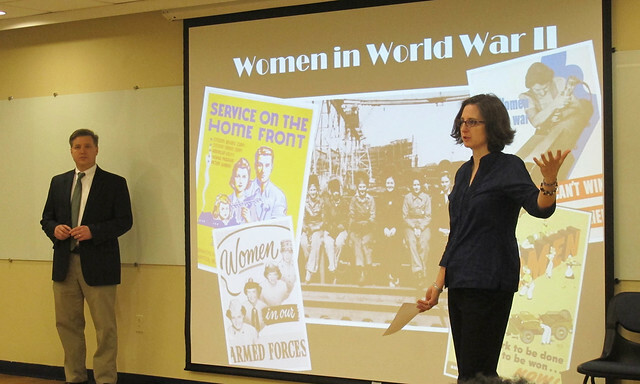 Students heard inspiring stories from three female veterans at the "Wonder Women of World War II" on-campus event March 14, hosted by Point Park's history department and Honors program. "It was inspiring to hear how proud these women were of their service to their country. They took their own pride in their country and used it for good during a time of significant need," remarked Liam Dickinson, a sophomore acting major. "The female veterans were really inspiring. You don't often see women being acknowledged for their time served during WWII and Vietnam. Also, it was interesting because all of the speakers' perspectives were so unique," said Kaylee Ritchee, a senior English major. "One of the women, Kathleen Swazuk, published her own book of poetry about her experiences and I thought that was very inspiring as well, because she was encouraged — and encourages others — to speak about experiences that often go ignored," added Ritchee. Also at the event, Todd DePastino, historian and founder/executive director of the Veteran Voices of Pittsburgh, told the remarkable story of how not only women's lives changed during WWII, but also how the whole culture had to change to accommodate these radically new gender roles. Additionally, DePastino talked about Rosie the Riveters, the WAVES, the WACS and the much-disparaged WASPs, who only achieved official recognition decades after WWII. "Todd DePastino's lecture gave students a great introduction to American gender dynamics in the 1940s. Movies often portray women rushing to work for patriotic reasons in that era, and DePastino showed that it was a much more complicated story," explained Jehnie Burns, Ph.D., assistant professor of history. Following the presentations, students had the opportunity to ask the speakers questions about their wartime experiences and meet with them individually. "My favorite part was meeting the women who served in the wars. It was such an honor to hear their stories," said Stephanie Mihalik, a sophomore mass communications major and transfer student. "It makes history more real."